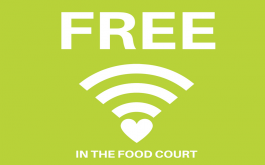 Centre News & Retailer Offers » Free WI-FI in the Food Court! Mount Gambier Central offers FREE WI-FI in the Food Court! Grab a cuppa or a bite to eat and sit down and relax as you surf the net! Don't forget to check us out on Facebook and Instagram.